The Grimoire Kickstarter that ran last year failed to achieve its goal, but the game made it through the Greenlight process and will soon hit Steam as an Early Access release. Before that, however, there will be an open alpha test, which is live and will run until the Early Access launch in February. At its core, OmniConnection's Grimoire: Manastorm is a shooter, but in a style reminiscent of Hexen, players wield magic instead of guns. 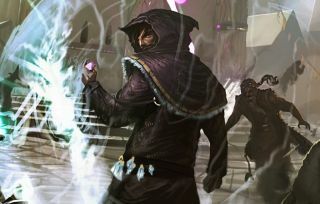 There are ten different classes of wizard to choose from, each customizable through a variety of offensive and defensive spells, and it also incorporates elements from MOBAs like Dota 2 and League of Legends. "MOBA elements come into play in a couple areas. The first and most obvious is our class designs," OmniConnection's Kyle Phillips said. "Passive abilities set Grimoire's wizards apart on a more fundamental level than a weapon swap might. In addition, 'ultimate' attacks add a tactical dynamic that is more at home in MOBAs than shooters. We've basically added weapons like UT's Redeemer and Quake's BFG to a class kit rather than as a rare weapon pick-up." The impact of the MOBA influence will also vary depending on the game mode being played. "For Safeguard (PvE) our designs include an in-round progression system similar to most MOBAs. This would allow us a lot of freedom to quickly scale up the difficulty and stakes of battles in a way that offers a huge amount of replayability," he said. But Grimoire is still early in development, and he added that it will ultimately be up to the community to determine which of these elements make it into the final game. "We aim to create a truly unique FPS, but we don't want to get too far away from the core player versus player mechanics that make the shooters so endlessly entertaining." There's also been a slight change to the game's title, although probably not for the reason you'd expect. You may recall that the Grimoire Kickstarter came under fire last year from Cleve Blakemore, who's been working on an RPG entitled Grimoire: Heralds of the Winged Exemplar since 1997. He ultimately didn't follow through on his threats, but another conflict came up that the studio took more seriously. "Shortly after the dispute with Cleveland we heard back from our lawyer that our trademark filing had been rejected due to an existing trademark held by Square Enix," Philips explained. "We changed the name of the game to avoid any potential of dispute with Square Enix and because we thought Manastorm sounded really cool." Sign-ups for the Grimoire: Manastorm open alpha may be placed at OmniConnection.net.